I first came to Middle Eastern dance in 1984. Intrigued when I read how music and dance are integrated into the lives of women in the Middle East, I fell in love with the movements and music at my first workshop. It was like a homecoming. This love affair with the traditional dance of Egypt, continues to this day. I know and see its potential. When Raqs Sharqi is danced from the heart, it is always fresh, always able to surprise. In all its varied forms from pure entertainment to high art, it enchants. It is a world dance of complex refinement as well as simple celebration, far removed from its reputation as an overt demonstration of female sexuality. 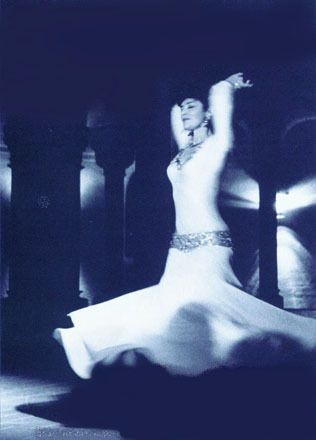 For seventeen years I studied Raqs Sharqi with an inspiring and uncompromising teacher, Suraya Hilal. The training was hard but my teacher’s insistence on the integrity of the dance has stayed with me as a guiding principle in performance and teaching. Teaching is what I love best. My background in Yoga and Tai Chi, Pilates and Alexander Technique as well as my own ongoing dance development are the tools with which I can help students find their dance within the Egyptian tradition. I teach that the charisma of the dance is to be found through good technique but more importantly through a simple direct response from the heart to the music.